After South Africa, Maharaja’s European summer tour continued with his participation in a 24-hour kirtana festival that took place at Villa Vrindavana in Florence, Italy. Villa Vrindavana is an ISKCON establishment located on the Chianti Hills in the Tuscany region, which is well-known for its medieval historical significance. The main building is a 16th century Renaissance Villa that overlooks 80 hectares of property, surrounded by green forest and olive plants. An Italian garden with a central fountain and exotic plants add glamour to the property. Peacocks freely roam around and it’s no wonder why this this small corner of paradise has been named after Krsna’s eternal residence. 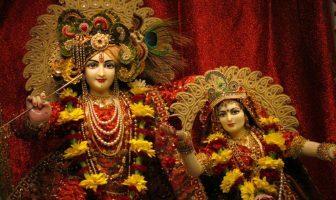 The presiding deities of this temple are Sri Sri Radha Vraja Sundara, Jagannatha Baladev & Subadra and Sri Sri Gaura Nitai. The weekend weather was beautiful and devotees from all over Europe joined in. The main kirtana leaders were Madhava Prabhu, Amala Harinama Prabhu, Jahnavi Harrison and HH Kadamba Kanana Swami. HH Candramauli Swami was present as well but as the lead dancer as he spent 20 of the 24 hours in the kirtana! The prasadam was typical local cuisine – pasta and lasagne. Apart from leading ecstatic kirtanas, Maharaja also gave class twice. In one class, he spoke on the verse ‘harer nama eva kevalam’ where he highlighted the importance and great benefit of chanting Hare Krsna. In the second class, he spoke on Srimad-Bhagavatam 5.10.15. One thing that he pointed out, is that in India one is likely to be asked his gotra (descent from a common male ancestor) and as devotees we can always say that we are acyuta gotra – descendants of the infallible lineage of Krsna. Overall, it was an ecstatic weekend and Maharaja is currently at the Summer Camp in Serbia. If you cannot view the slide show, just visit flickr!